They can do it themselves. Unless they have typographical expertise and knowledge of composition, layout skills as well as the technical issues involved, the result is likely to be less than remarkable. They can get it done cheaply. This may result in the same outcome as above, or perhaps give something ok, average or unuseable. A cheap designer is either inexperienced or isn’t prioritising the job as they have better things to do. Even if it’s ‘a mate’, many people run into trouble as the designer has to prioritise paid work, it’s just a fact of life. Either way, there’s a risk that the wonderful expertise promoting work that your book should be, may go out in the world a bit lackluster. They could spend a lot of money on it. But all this is missing the point. The cover of your book is not just another graphic design job that needs to be ticked off in the same way that you need a plasterer to do the walls of your house. It’s not someone coming to fix the radiators or make the sandwiches. It’s not like insurance where you get the cheapest quote you can. It’s not even something that the more you pay the better the result. It’s not something you have to get out of the way in order to publish your book. Your cover IS the book. You think that the hard slog of writing, the early mornings, the late nights, the rushing to meet your deadline, the painful editing, the writers blocks and the years of research and experience is your book. It isn’t. The clever title that communicates the message of the book, the relevant and neat typography of the title and subtitle and the metaphor contained within the image or graphics on the cover – that’s your book. To put it another way: the COVER is your book. In fact, many best-selling expert authors suggest that the first thing you do when you’re about to write the book is to not write the book but design the cover. With the cover you can gauge interest in the book and take advance orders for the book (i.e. sell it before you’ve written it). A book with a cover is a real book (even if it doesn’t yet exist as a book). This is part of the magic of publishing and how books are embedded into our consciousness. Today, more than ever, the concept of the cover transmits the Big Idea that can arrest and hold busy minds whose attention is eager to flit to something else. We don’t have time to wait till chapter 3 before we reveal our purpose to our readers. We can’ even rely on them getting it in the introduction. We have to get it to them right there up front with the cover, through the use of the right words, images and colours. Once that eye of attention of our potential reader settles on our cover we have only a fraction of a millisecond for the image we have created to inspire neurons to fire in the mind of the observer. If the meaning and significance transmitted is unclear, dull and uninspired, the eye of attention will move on. If on the other hand it shines, causes an itch, invokes curiosity, intrigue, humour or hints at a solution, the image in the eye triggers a cascade of neurons to fire. This in turn makes new connections in the eye of the beholder which shoots a message from the deep unconscious to the conscious that says quite simply: find out more. That’s the purpose of the cover. It’s a visual consciousness magnetic neural network triggering mechanism. And to create one of those you need more than a ‘graphic designer’. To create one of those you need more than to just say that oh-so-underwhelming instruction, “just do me a cover”. People won’t judge you by your wit on page 230. They won’t judge you by your startling conclusion. They won’t judge you by your extensive research and experience in the field. They will judge you first by what they see. And what they see is your cover. 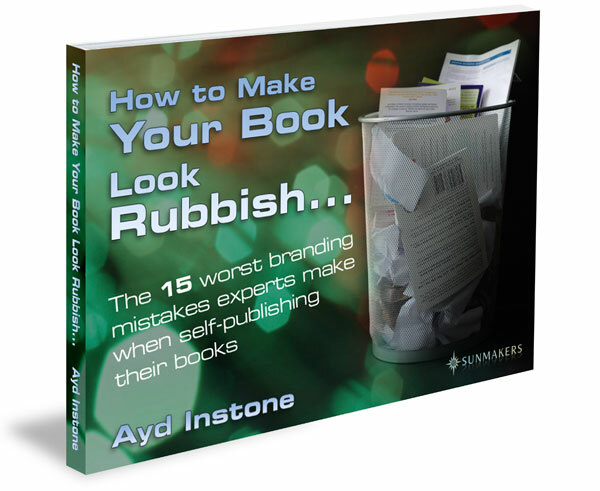 Most self-published books are rubbish. Or at least they look like rubbish. By rubbish I mean garbage, trash, litter, junk, waste. Let’s take it further: excrement. Some self-published books might have some good content in. They might. But who cares? They look like pap. Let’s face it. If the author couldn’t be bothered to package the content properly, what level of care do we assume went into the information contained within. Would you look forward to enjoying a sandwich if it was wrapped in toilet paper? You’d assume, quite rightly that there was a risk that the food was less than palatable, perhaps even poisonous. We judge a book by it’s cover too. And quite rightly so. If you’ve ever bought an Apple product you know they have spent an awful lot of time and effort on making the unboxing of it a wonderful experience. The author of that cruddy looking self-published book didn’t give two hoots about your reading experience. All they cared about was their own content. How selfish is that? They used to make me laugh. Now they make me sick. Here’s why. Producing a cruddy book is selfish and arrogant. It’s as if the pig ignorant author is so haughty that they believe you should perceive them as an expert based on such flimsy evidence. It’s like they just couldn’t be bothered. But they would probably expect you to pay them extortionate fees for their consultant service or whatever new-media snake oil they’re flogging. Now they’re offering you something that’s going to lower the tone of your bookshelf. It’s also selfish to the rest of us who really want to use self-publishing to deliver our excellent books to our audiences. The self-obsessed cheapskates are ruining the marketplace for us. Sooner or later, when people who hear your book was self-published may assume it’s total tut before they’ve even seen it. This is why your books and products must not look like they are self-published. It’s not hard. You wouldn’t go to a business meeting dressed in a previously used big bag, so why send your expertise out in one?